Should you be opening up a brand new MacBook Pro this Christmas, chances are you'll also be wanting to get Spotify installed at the earliest opportunity. Now there's another reason to download the official Spotify client for macOS - it's been updated to support the versatile Touch Bar strip found along the top of the keyboard on Apple's most recent batch of laptops. The Touch Bar shows search, shuffle, repeat, play, pause, skip and volume controls when the Spotify app is open, users are reporting. A playback scrubbing tool shows up when the app's in the background, apparently. 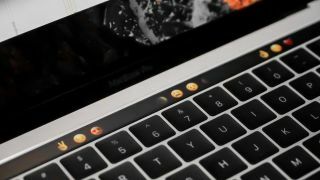 Spotify's developers have obviously prioritised Touch Bar support in the run-up to Christmas - users are still waiting for apps for the Apple Watch and the fourth-generation Apple TV, which don't appear to be arriving anytime soon. And Spotify isn't the only high-profile application to now have Touch Bar support - Photoshop shortcuts were added a couple of weeks ago. Meanwhile the interactive strip can also be used to play a tiny piano or the original Doom.